A 12-Point Recovery Plan for Extension? 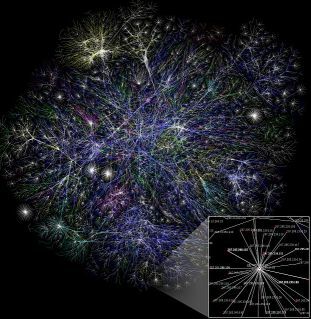 A map illustrating the dense network connections of the Internet. I’m an unrepentant movie buff. I can’t get enough of old movies, virtually all types of movies, and I catch myself every day mentally replaying scenes from some of my favorite flicks, much as one would an endearing old tune. One film that will remain deeply etched in my mind is “I’ll Cry Tomorrow,” starring Susan Hayward, an exceptionally well-acted biopic about the late singer/entertainer Lillian Roth. Through a series of unusual misfortunes, beginning with a psychologically domineering and manipulative stage mother, Roth developed a debilitating alcohol addiction. The movie depicts the horrific downward spiral that followed until Roth finally summoned the courage to follow AA’s 12-Point Recovery Program. Oddly, that movie popped into my mind in the course of reflecting on Cathann Kress’s very considerate and thoughtful reply to a piece I posted last month titled “The Coming Extension Extinction,” which has ignited some impassioned discussion within Cooperative Extension ranks in the weeks since it was posted. Dr. Kress’s response eloquently expressed a theme reflected in many of the other critiques I’ve received within the last few weeks. She contends that the digital imperative does not present Extension with any sort of existential crisis. We can have our cake and eat it too. We can still do what we’ve always done so well — reach people with meetings and workshops, even as we gear up to address the digital challenges. With all due respect to Dr. Kress’s thoughtful comments, that’s the part that not only worries me but also reminds me of Lillian Roth’s perennial struggle with addiction. In some respects, our fixation on traditional delivery methods resembles a self-destructive addiction. My fear is that this pattern of thinking amounts to a kind of psychological entrapment. It presents too many of us with the excuse to stick with business as usual — in many cases, to lapse into what my father often described as “Let George do it-style” thinking. And considering that the median age of Extension professionals is likely well past 40, this kind of entrenched mindset will exert even more corrosive effects in the future. This brings me back to AA and the Twelve-Point Recovery Program. In a real sense, Extension needs to flesh out a series of systematic steps toward recovery — some strategy to break us of this ironclad commitment to older delivery methods. And along with this, we need to conceive ways to reach the growing numbers of younger clients for whom face-to-face encounters are not considered as convenient or as valuable as virtual interactions. And allow me to raise once again the added challenge of generative capacity. The massive sharing and social collaboration made possible by networking enables information to be generated at vastly accelerated volumes. That is why success in the 21st century is succinctly expressed in this corruption of the Golden Rule: He who builds the most adaptive, fluid and generative networks rules. Success in the digital era is all about who builds the most fluid and adaptive digital networks, the most highly reciprocal and generative networks — networks that are responsive to the needs of contemporary learners, especially younger ones. We can’t secure this kind of generative capacity through old delivery methods. Why? Because they are not generative enough — they no longer generate adequate volumes of information. To put it another way, the networks constructed via these older delivery methods simply aren’t scalable for growing numbers of people, especially younger people. Yes, as I’ve said before, there is a place for traditional one-to-one delivery methods. Even younger people occasionally want to enhance their virtual interactions with one-to-one engagement. But make no mistake, the future is digital. The future belongs to those who not only appreciate the awesome power of generative capacity but who actively harness it. The future belongs only to those who build highly fluid, highly generative, digital networks.